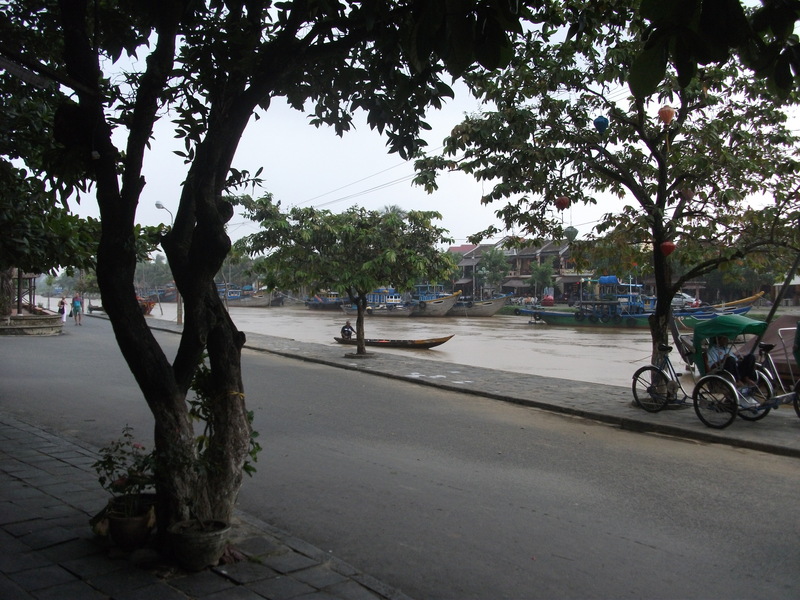 We left Saigon yesterday morning. 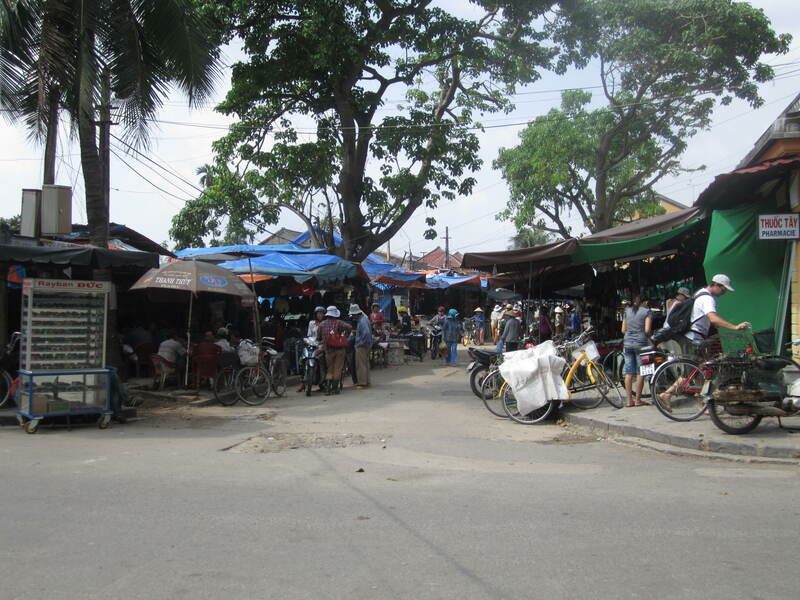 We had time in the morning to grab some breakfast (and more Vietnamese coffee) at Highlands Coffee down the street and we walked around the neighborhood a bit before heading back to the hotel to grab our things and check-out. 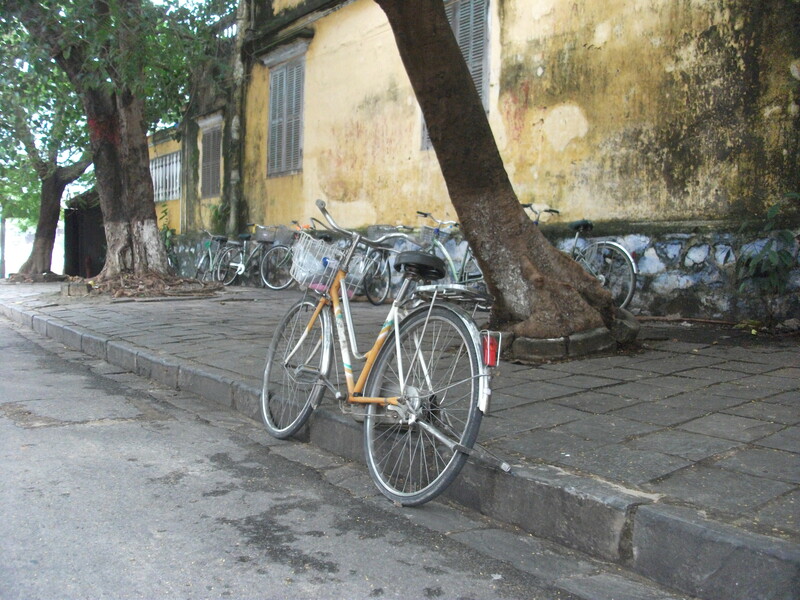 The hotel staff was so friendly; they were always smiling and holding open the door for us, making sure we were enjoying our time in HCMC. One of the staff hailed a cab for us on the curb and made sure we got on our way alright. 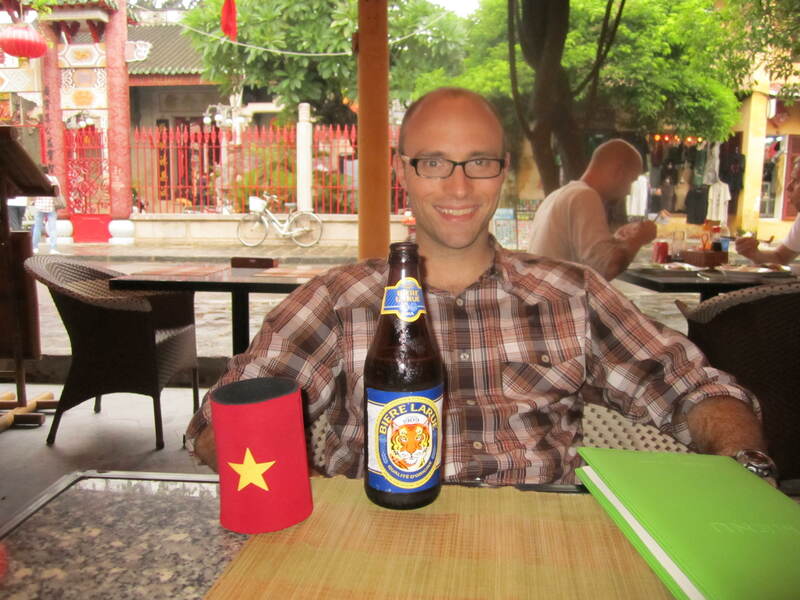 If you’re ever in Saigon, the An An 2 is great little place. Once we made it to the airport we had to navigate away from the international terminal to the domestic one which is much smaller and not quite as nice. 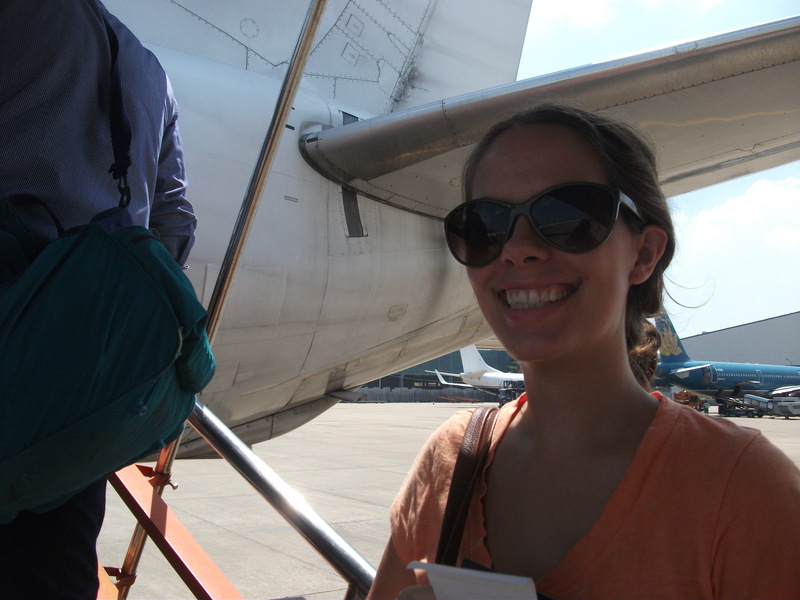 We arrived around 9:30am, were on the plane by 10:30am, and on the ground in Da Nang by 12:10pm. 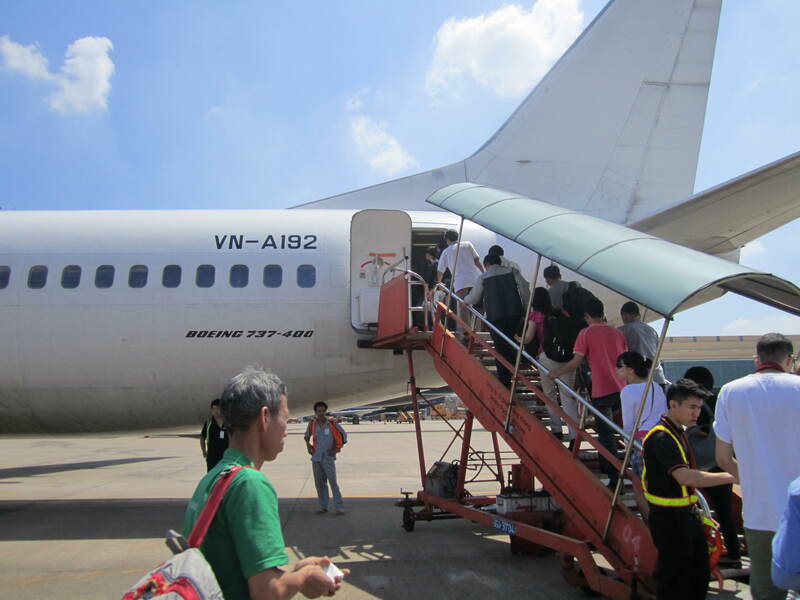 Getting on our plane to Da Nang! 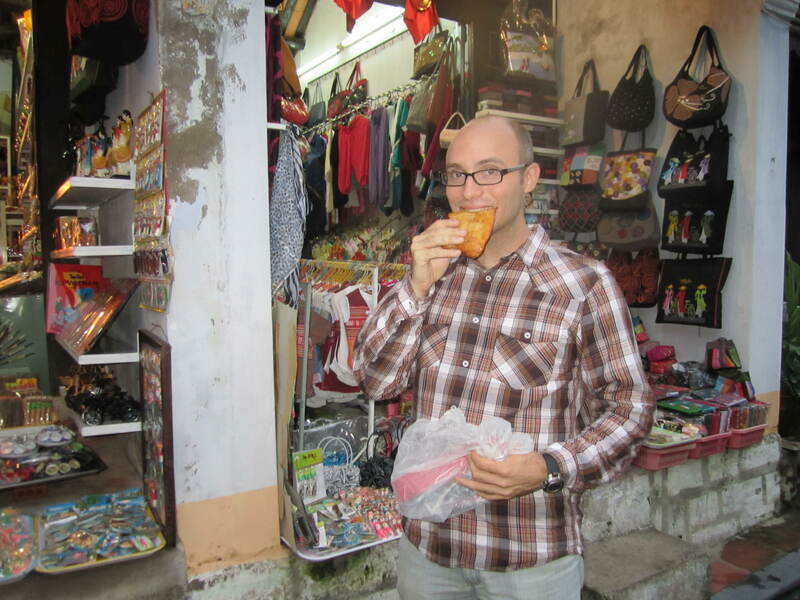 Once in Da Nang we split a cab with a Finnish couple to Hoi An. The total fare was 519,000 dong ($25) so it was nice to split that between the two couples. We had decided not to book a hotel before arriving so that we could look around if the hotel of our choice was full. 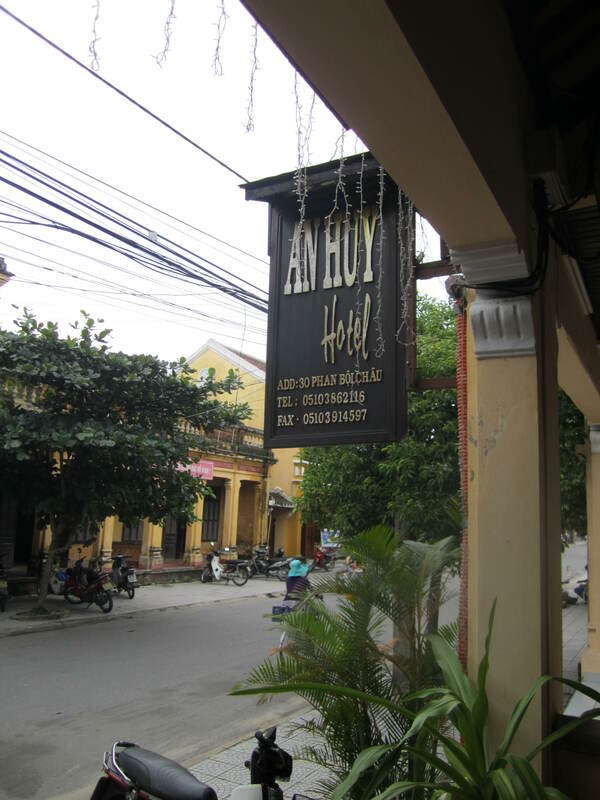 Zach wanted to check out the boutique hotel, An Huy, first so that’s where the cab dropped us off. Lucky for us they had room available (there are only 14 rooms)! We were able to get a standard room ($30/night) for all 3 nights we are here. 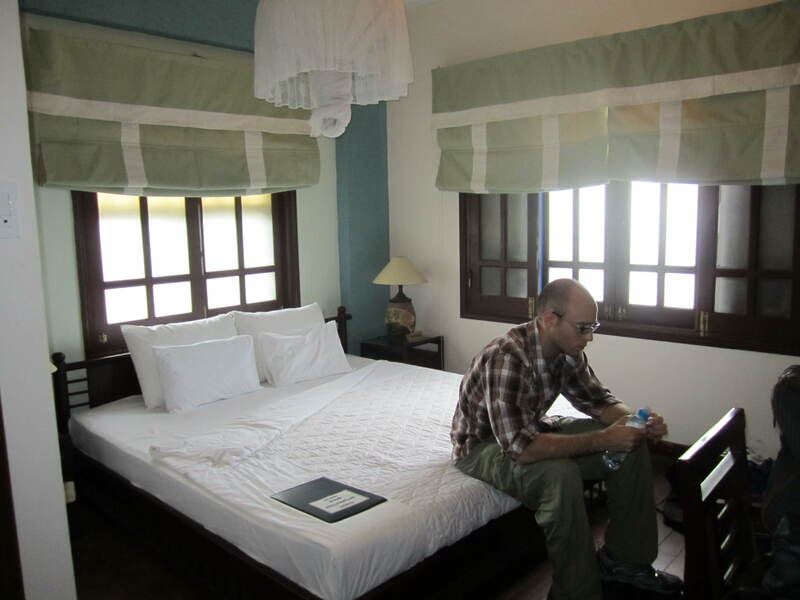 The attendant even let us choose between 2 different rooms – we chose the larger one at the back of the hotel. It’s really a gorgeous and simple hotel. We still have A/C, tv, and a minibar like the last hotel it’s just a little bit fancier with its decor and a lot larger of a room. Plus we get complimentary breakfast! 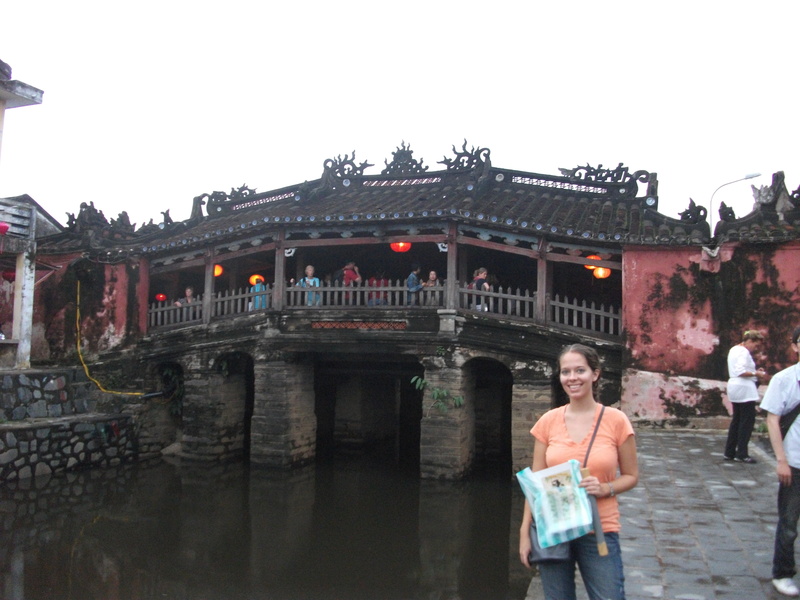 The first thing I wanted to do in Hoi An was get over to the tailor and begin the process of having some clothes made. We will only be here until Saturday and I’ve read you have to go back a couple of times for fittings during your stay. 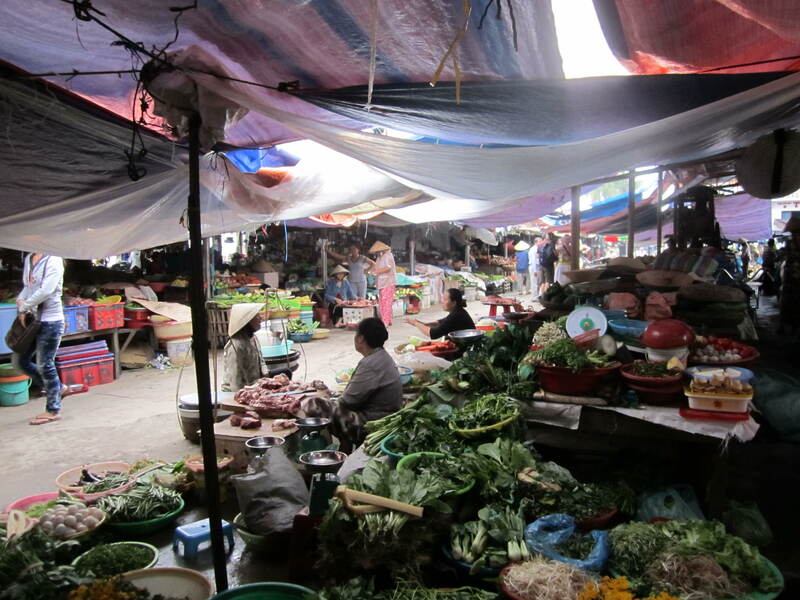 As we headed to our chosen tailor, Yaly – the best in town – we walked through the Hoi An market which is really intense. 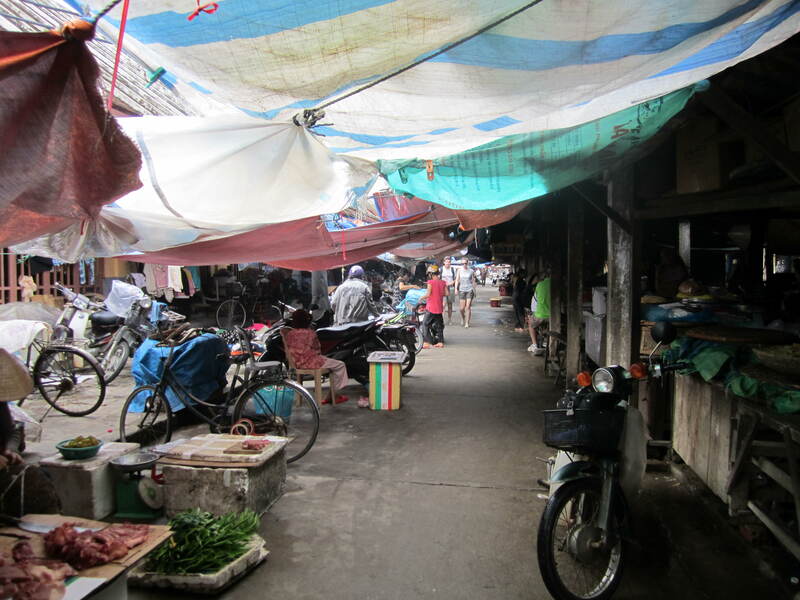 It’s quite large and all outdoors so there are tarps and umbrellas covering each stall making the market an extremely close and dense place. 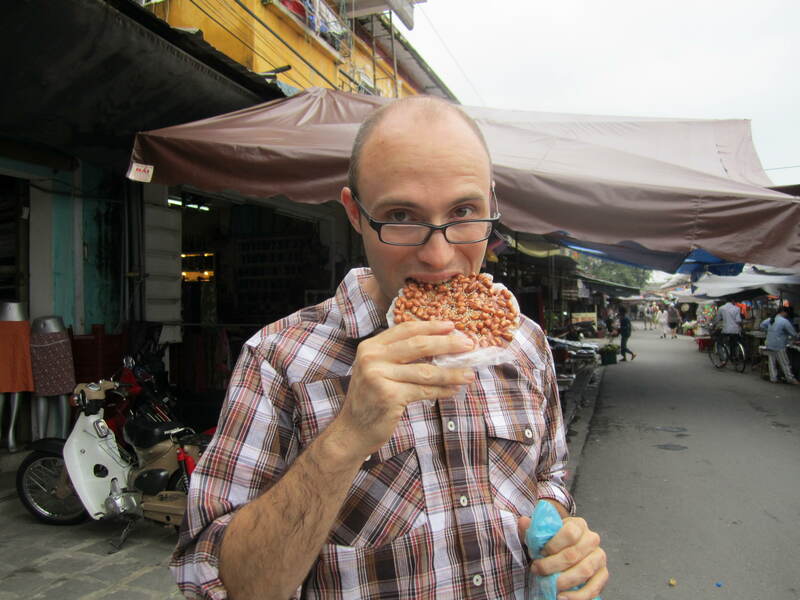 Zach bought a little sticky peanut cluster on rice cake and had to eat that before we went in the tailor… of course then he had sticky peanut stuff in his teeth. What a great first impression! When we walked into Yaly there were people waiting to help us. They have catalogs you can look through, clothes on models, or you can bring in your own photo of clothing you want made. Then you choose the materials – which is where price comes into play – and the small details about your item – pockets, buttons, lapel style, lining color, etc. I decided to have a wool jacket and a blazer made and Zach is having a suit, a dress shirt, and a wool jacket made. We go back today for our follow-up fitting. 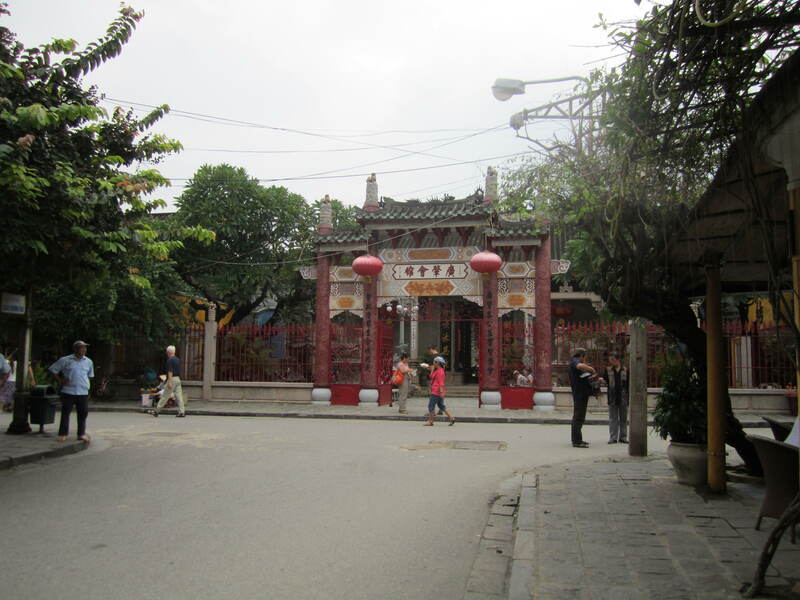 After Yaly we decided to walk around the Old Quarter, which is a UNESCO world heritage site, and do a little shopping. It actually ended up being the most shopping we have done thus far. Zach bought silk and wool ties, we bought a couple of paintings from 2 different local artists, and a couple of Tiger Beer tees. 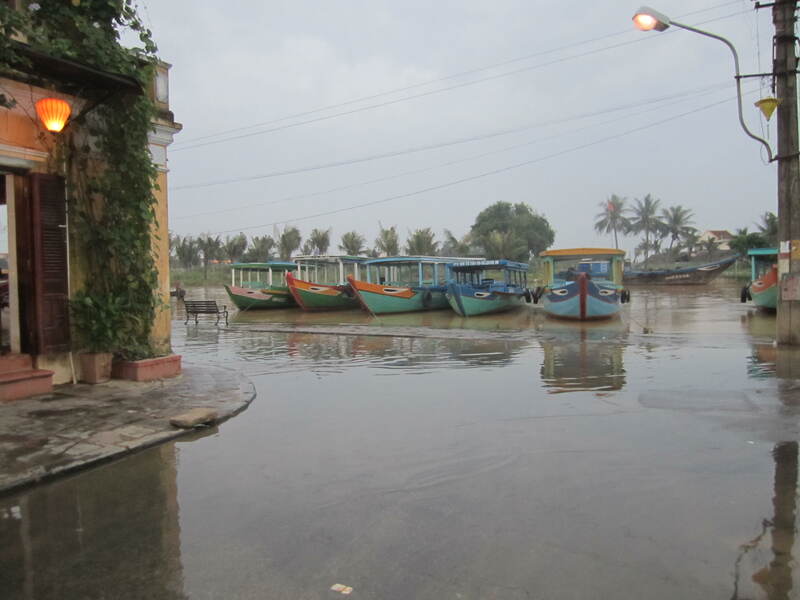 There was a brief shower of rain so we took cover in a restaurant for a very late lunch – Cau Lau, a Hoi An specialty, and crispy pork skewers. I didn’t know that there was construction involved in my dish and upon seeing me eat it incorrectly, one of the waitresses came over and demonstrated – a little embarrassing! I was supposed to scrape the pork off the skewer and onto rice paper, then use the side salad to add some veggies, and then roll up the rice paper as a wrap. I never would have figured that out on my own! We wandered around for a quite a while taking everything in. 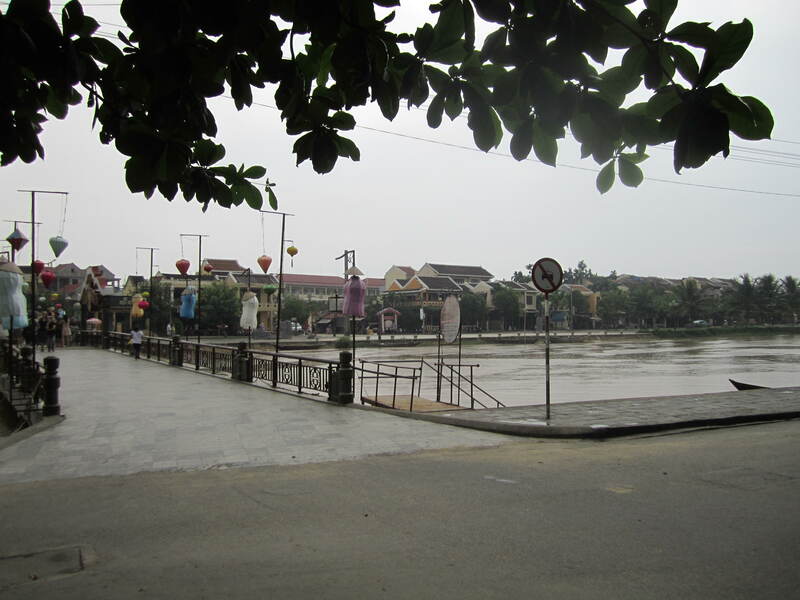 Hoi An is gorgeous and extremely different from the huge city of HCMC. We are both really excited to be here for the next few days. Not sure what’s on today’s schedule, but it’s time for brekkie!